Alliums are a large group of plants that include leeks, onions and garlic. They are found growing predominantly throughout the cooler regions of the Western Hemisphere. 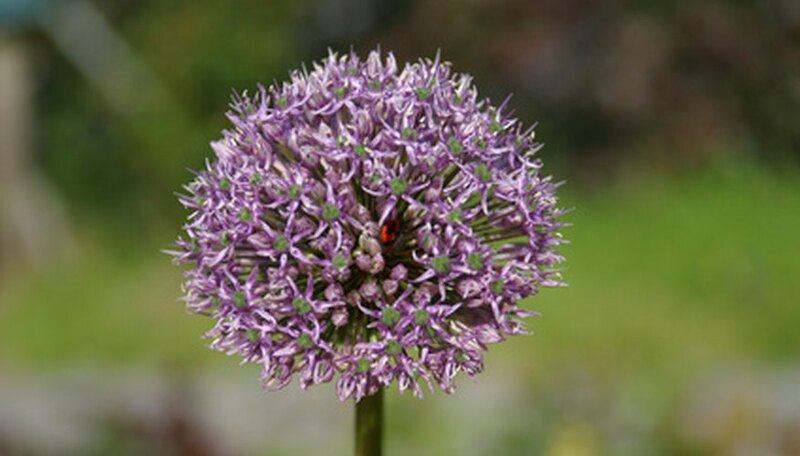 Although alliums are grown largely for their use as a food crop, there are many varieties of allium which are grown purely for their ornamental attributes. Varieties like the star of Persia (allium christophii) and giant allium (allium hollandicum) produce distinctive globe-shaped lilac-purple flowers which make for excellent flower arrangements, both fresh and dried. Alliums are relatively easy to grow from seed, although germination can be lengthy depending on the variety you are planting. Gather the seed heads off allium plants. Cut each head off, leaving approximately 2 inches of stem. Do this in the fall, from September through October, as suggested by the Gardener's World website. Place the seed heads into a paper sack, or spread them out into sheets of paper to dry, for approximately 10 to 14 days. If you use sheets of paper, make sure they are in a place where they will not be disturbed. Remove the seeds from the flowers heads by tapping the stem with your finger. Fill up a basin or bowl with about 2 to 3 inches of water. Put the allium seeds into the water to check on the viability of the seeds. Discard all seeds that float, but retain all the seeds that sink. You can use an aquarium net to scoop out the floating seeds. Place the allium seeds onto paper towels to air dry for about one day. Scoop a soil-less seeding mix into a seed-starting tray or flat. A soil-less mix will contain peat moss, vermiculite or perlite, sand and sometimes a little lime and compost. For best results, make sure the mix is also sterilized. Sow the allium seeds generously across the surface of the mix in the tray or flat. You can pinch a bunch of seeds together between your thumb and index finger, or if you prefer, use a pair of tweezers or forceps for a more accurate planting. Space the allium seeds 1/4 inch to 1/2 inch apart. Press the allium seeds about 1/8 of an inch into the seeding mix using a spoon or a small piece of wood. Put the tray where it will remain at approximately 70 degrees F for three weeks. Check on the tray at least once a day. Do not over-water the allium seeds so they become sodden wet, but keep them moist by misting the seeding mix with a fine mist of water as needed. Transfer the tray after three weeks has passed and place it in a location where the temperature will not go below 50 degrees F or above 70 degrees F. Leave the tray in this location during the remainder of the germination period. Depending on what variety of allium you are growing, germination can begin in about one year. According to the University of Maryland Fact Sheet on Alliums, most allium grown from seed will begin flowering in about two to three years.